It is very important to follow certain steps to prepare for your procedure at the Rye ASC. Following these steps helps to insure that you have a safe experience. Furthermore, your procedure may have to be delayed or cancelled if you do not prepare for your procedure properly. · A responsible adult must accompany you to the Rye ASC and be available to discuss your discharge instructions and to drive you home. An adult should also be available to you at least 24 hours after the surgery. Please do not bring young children with you to the Rye ASC. · Do not eat or drink anything after midnight the night before your surgery. This includes food, liquids, water, chewing gum, candy, mints, etc. · If you are taking medication of any kind, consult with your physician about specific instructions regarding your medication schedule prior to surgery. · You may brush your teeth or rinse your mouth the day of the procedure but do not swallow. · If any change in your health occurs within one week prior to surgery, such as a cold, cough or fever, please notify your surgeon immediately. · Wear comfortable, loose fitting clothes to your procedure. You will be provided with proper attire while in the Rye ASC. · Do not wear make-up or nail polish the day of surgery, or per instructions by your surgeon. · Do not bring jewelry or other valuables with you. · If you wear dentures, contact lenses, eyeglasses or other prosthesis, you will be asked to remove them prior to surgery. Bring a case for contact lenses and eyeglasses. · A pre-operative history and physical examination and laboratory tests may be required prior to surgery. Your surgeons’ office will make these arrangements for you. · Please arrive at the Rye ASC one-hour prior to your appointment so that admission procedures and evaluation by the anesthesia staff may be accomplished. · Please bring all your insurance cards and completed forms to the Rye ASC. We will expect you to be responsible for the facility charge if your insurance does not cover it. This may include such costs as the charges for use of an operating room, equipment and personnel. Filling out the insurance and billing form will help us complete and file the necessary claims with your insurance carrier for the facility charge. · The Rye ASC is located on the first floor at 1 Theall Road, Rye, New York. Click here for directions. · There is free patient parking in front of the building. 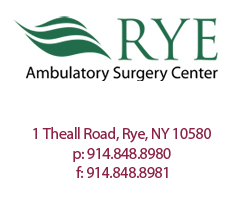 · If you have any questions about the Rye ASC’s fees, please feel free to contact our Billing Department at 914-681-3110 at least 3 days prior to date of surgery. · If you have any further questions, please call the Rye ASC at 914-848-8980.